COLUMBIA, Mo. – The University of Missouri’s 26th annual celebration of life sciences will take place April 12-17, 2010 at MU’s Bond Life Sciences Center. Focusing on life sciences education, research, outreach and economic development, the week will include a 2-day forum showcasing more than 300 research projects by students, postdoctoral fellows and faculty representing a broad spectrum of life sciences disciplines; an economic development networking event; science career exploration opportunities; seminars by internationally acclaimed scientists; displays featuring MU core research facilities and research centers; a large vendor show; an awards presentation recognizing excellence in student research; high school outreach and more. 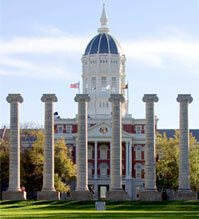 Missouri Life Sciences Week typically attracts more than 1,000 academic researchers, business leaders and policy makers. The events are free and open to the public. For more information and a detailed schedule of events, visit http://lifesciencesweek.missouri.edu. Featured lecturers will include Laurel Neme, natural resource management consultant and author, who will speak on the topic Wildlife CSI: Animal Investigators Solve Crimes and Save Endangered Species; Michael Lynch, Distinguished Professor of Biology at Indiana University and member of the National Academy of Sciences, an expert in the evolution of genomic complexities; Ian Baldwin, director of the Max Planck Institute for Molecular Ecology in Germany, who will present the Charles W. Gehrke Lecture; and Janet Butel, Distinguished Professor and chair of Molecular Virology and Microbiology at Baylor College of Medicine, presenting the Roma Eisenstark Memorial Lecture in Cancer Research. Glen Nowak, director of media relations for the Centers for Disease Control and Prevention, will present the Smith/Patterson Lecture, Communicating About Science, Health and Medicine: Who Knew It Could Be So Difficult?, at the Reynolds Journalism Institute, and also participate in a panel discussion focusing on communication between scientists and journalists. Free-lance science writer, Emma Marris, whose work is frequently published in the journals Science and Nature, will also be a panelist. The research forum will feature more than 300 projects, summarized on posters, in five categories: Molecular and Cellular Biology; Physiology of Health and Disease; Genetics, Environment and Evolution; Translational Technologies and Informatics; and Science and Society. A research competition for undergraduate and graduate students and postdoctoral fellows is held in conjunction with the poster forum. ACES (Alternative Career Exploration in the Sciences) will hold a career networking opportunity for graduate students and postdoctoral fellows to meet informally with representatives from a variety of science-related companies and organizations outside of academia. Exploring Life Sciences at MU is an event for mid-Missouri high school science students and teachers, exploring science careers and participating in the research poster forum. A SPARC (Scientific Partnership and Resource Connection) networking event will provide an opportunity for business leaders and entrepreneurial scientists to meet, chat and discuss possible collaborations to promote commercialization of academic research discoveries and economic development. The Saturday Morning Science presentation at the end of Life Sciences Week will feature William Seyfried, Jr., Professor of Geology and Geophysics at the University of Minnesota, speaking on Deep -Sea Hydrothermal Vents: New Technologies, New Discoveries.